After our sold out show at Bussey Building in Jan we return for a Bussey Building takeover of 2 rooms. 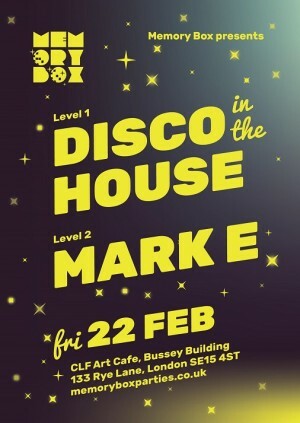 Disco in the House on the first floor and Mark E on the second floor. We celebrate all things disco. From today’s modern trippy disco twist from the likes of Todd Terje, Prins Thomas, Caribou, Space Dimension Controller, Derrick Carter, Andrew Weatherall, Bicep, Gerd Janson, Denis Sulta and Doc Daneeka, back through 00’s and 90's disco house from Daft Punk, DJ Sneak, Chicken Lips and Idjut Boys, back further to post disco punk classics from the likes of ESG and Liquid Liquid, right back to original disco cuts from Giorgio Moroder, Hamilton Bohannon, Donna Summer and Chic. Be it funk, boogie, house, techno or electro, you’ll hear disco influenced masterpieces, Memory Box disco edits, tribal rhythms, synth stunners, dubbed out disco grooves and select classics plus many an underrated hidden gem. Be it funk, boogie, house, techno or electro, you’ll hear disco influenced masterpieces, Memory Box disco edits, tribal rhythms, synth stunners, dubbed out disco grooves and select classics plus many an underrated hidden gem. Over the last decade, Mark E has established himself as a producer with a distinctive, almost instantly recognisable style. And his consistently strong releases for the likes of Running Back, Jiscomusic and Golf Channel, as well as on his own label MERC, have put Birmingham firmly on the house music map. As a DJ, he's no slouch, either. Listening back to a previous RA podcast is a great example of Mark's prowess: Cole Medina's Bee Gees-sampling "Love You Inside Out," Mark's own epic extension of Grace Jones' "La Vie En Rose" and a bunch of his—at the time unreleased—productions were expertly welded together to provide the perfect timeless laid-back soundtrack. To ensure tickets are delivered safely and securely and to keep the price as low as possible for you, the ticket buyer, Memory Box generally uses our E-ticket system unless otherwise stated. When you purchase tickets through Memory Box, the full face value of the ticket is shown. This price is the price set by the event promoter and we pay this full amount to the promoter without any deductions. "Memory Box Parties invite artists to play who are integral to the evolution of electronic dance music."